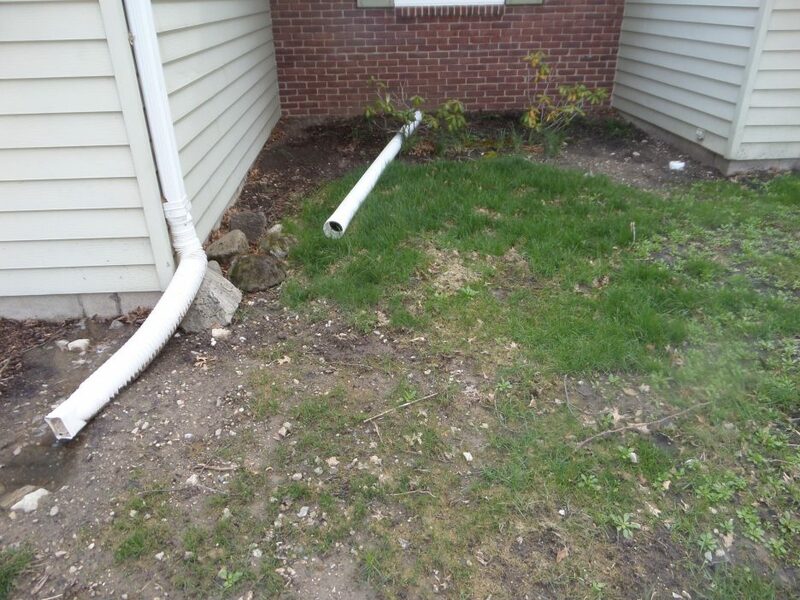 As a new construction project, this property needed everything. 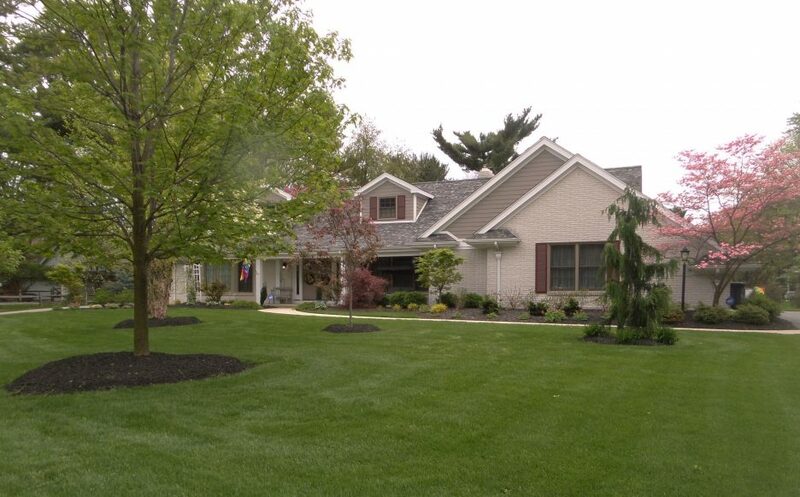 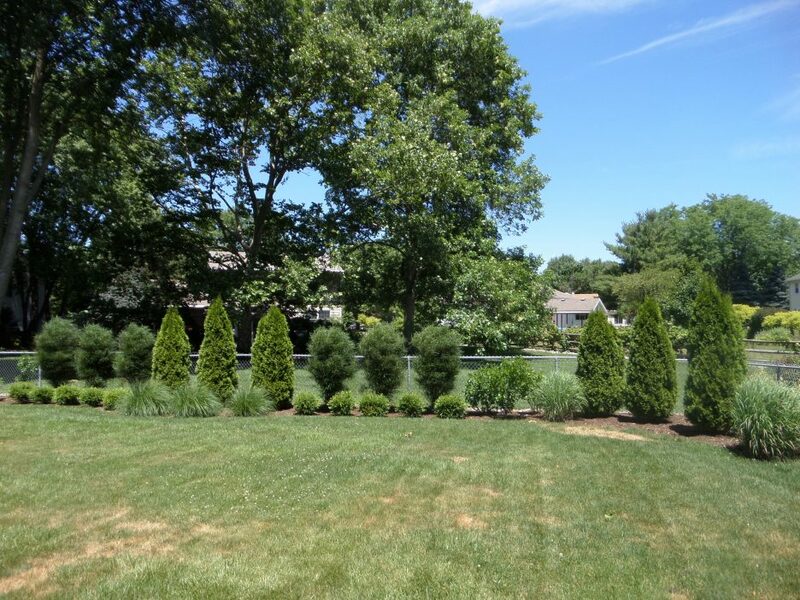 The homeowners did not want a large lawn, opting for two separate outdoor living spaces. 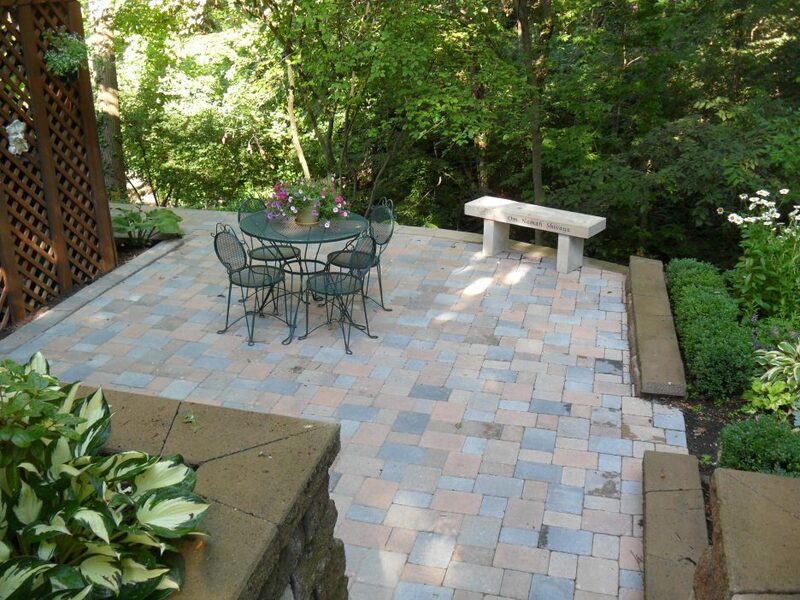 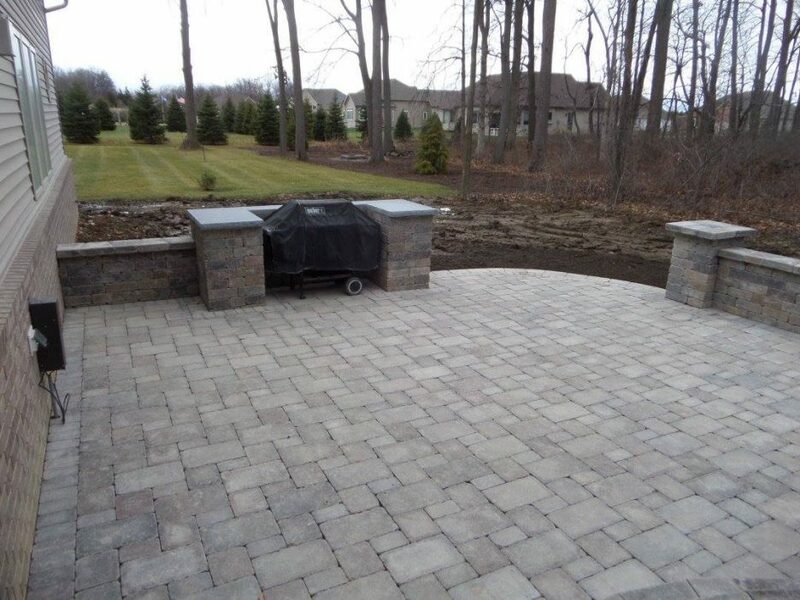 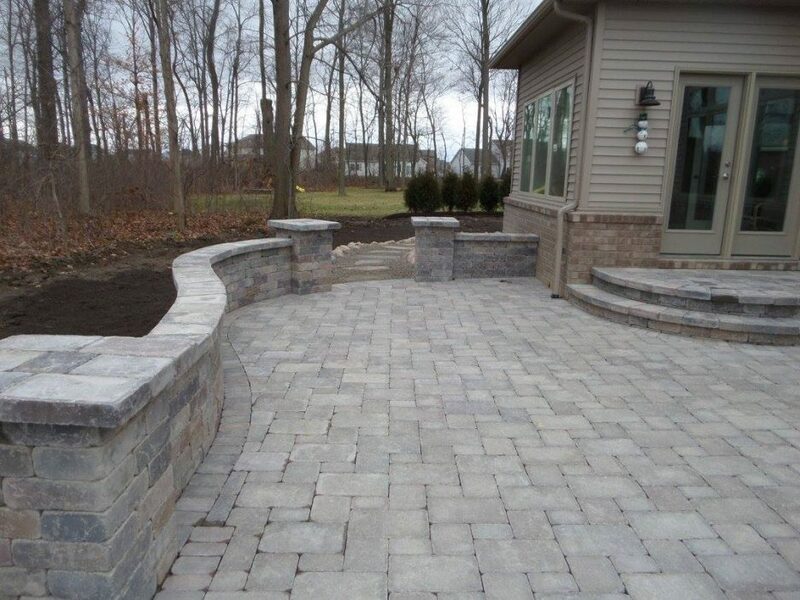 One formal patio with a seat wall and a spot for the grill, and another natural stone patio for intimate seating. 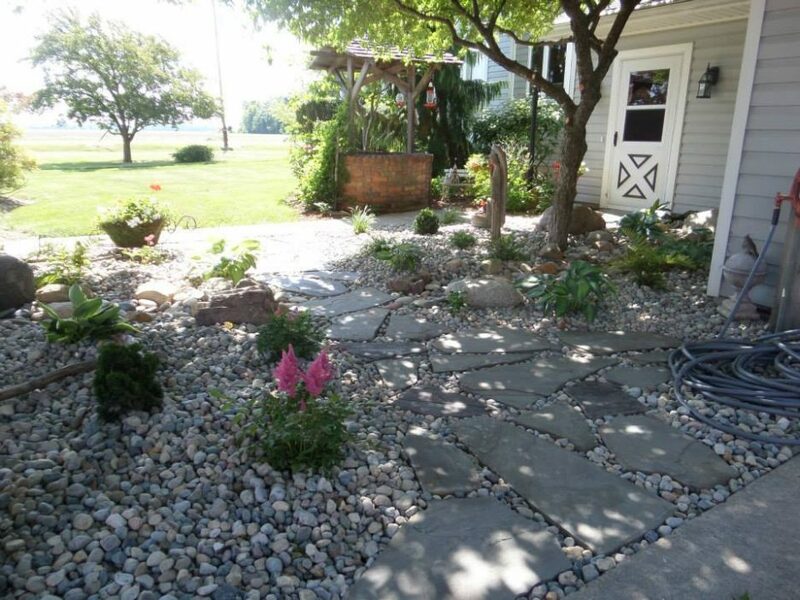 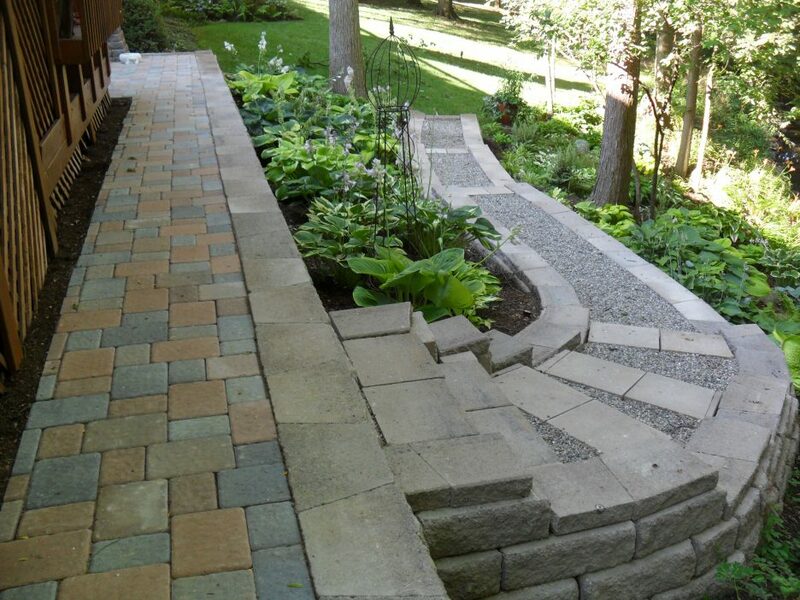 Both patios are connected with a stepping stone and gravel path. 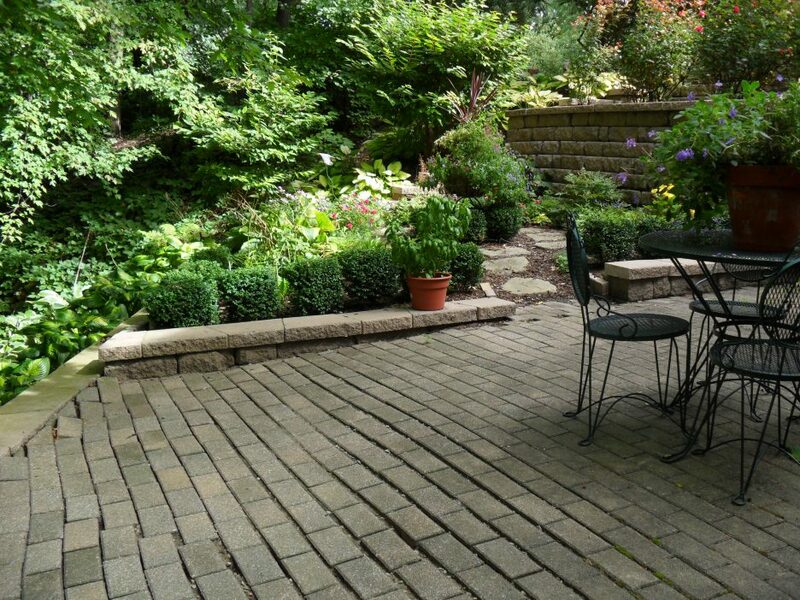 The sideyard on this condo is a narrow space separated from the neighbor by a winding sidewalk. 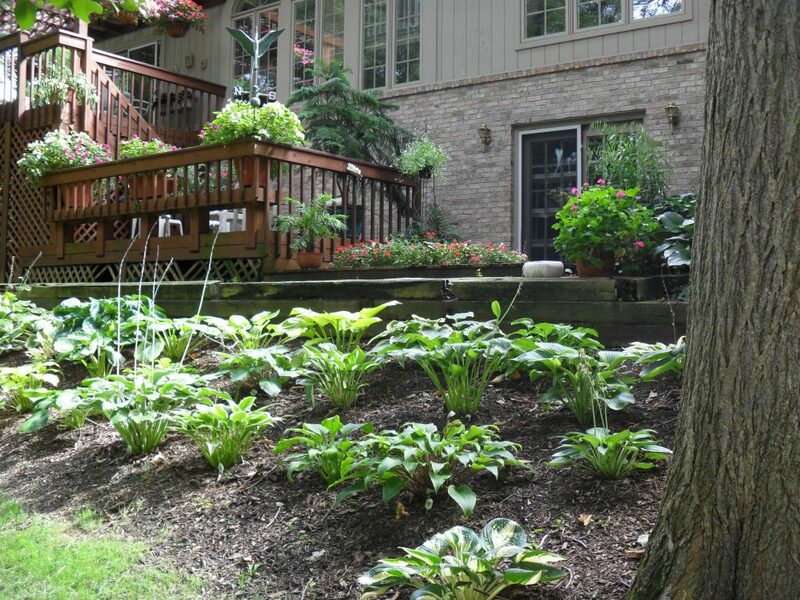 The original landscape had become overgrown and overwhelming for the homeowners. 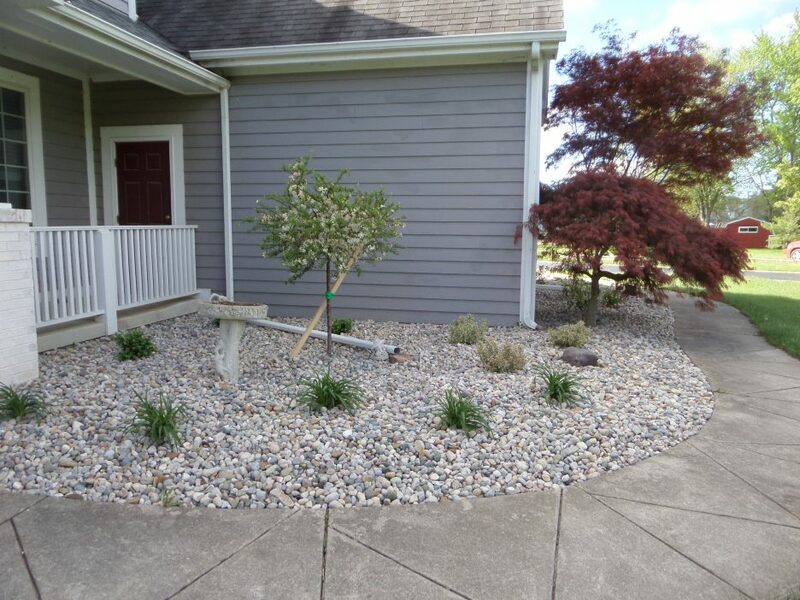 The new landscape adds more color without all the extra maintenance and headache. 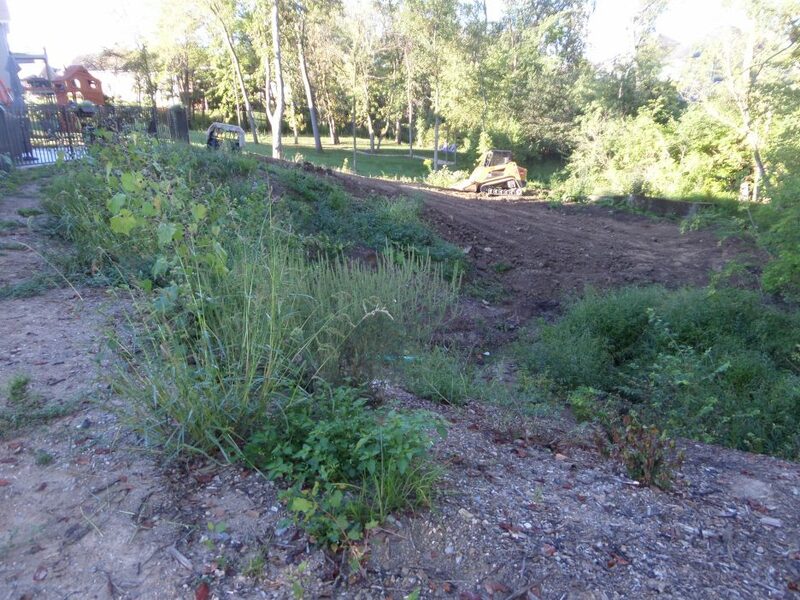 The existing landscape was not bad, just really boring. 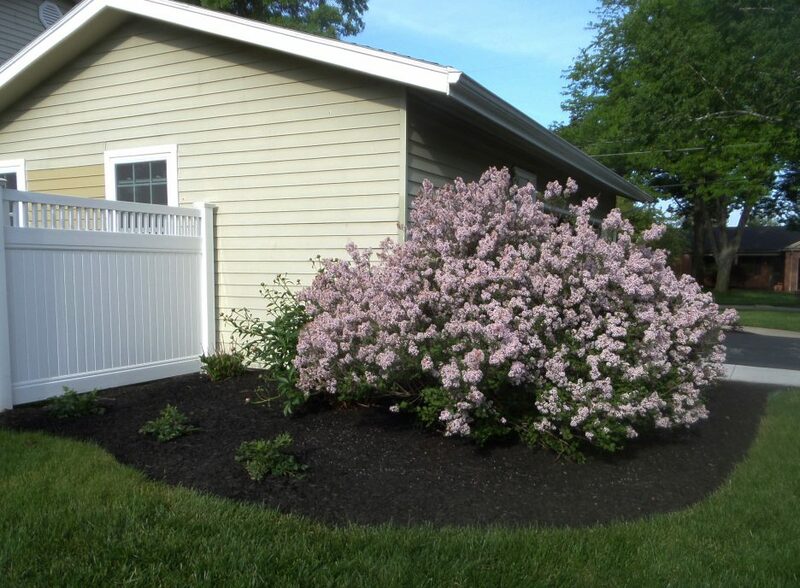 The new plants have interesting foliage and extend the bloom time later in the year. 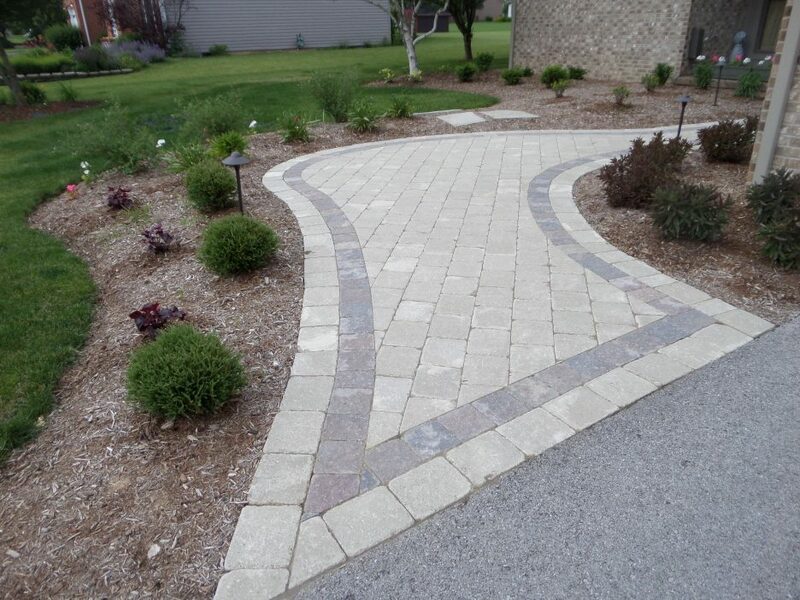 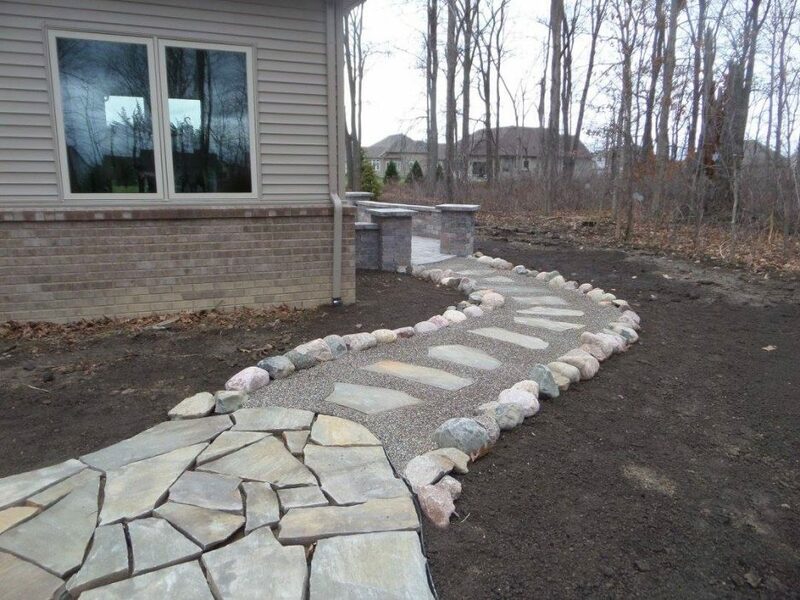 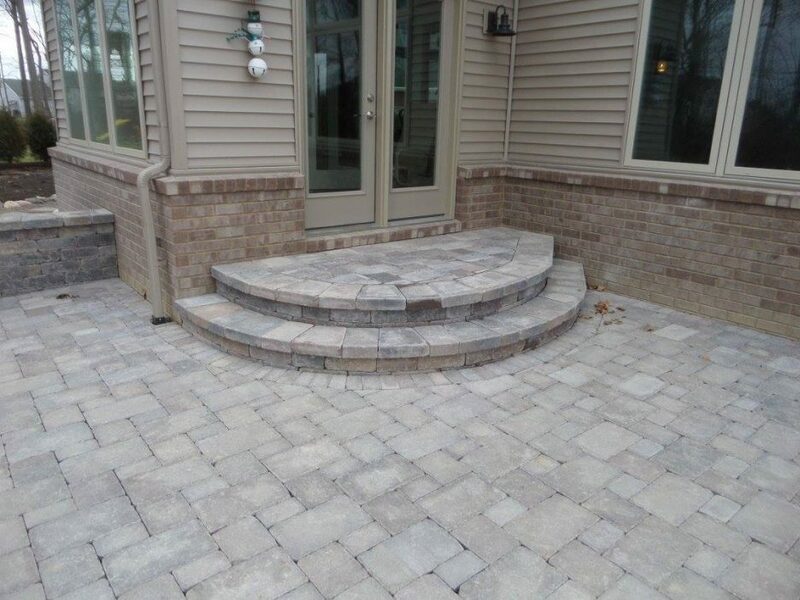 A new natural stone path and steps improves access from the driveway to the front door. 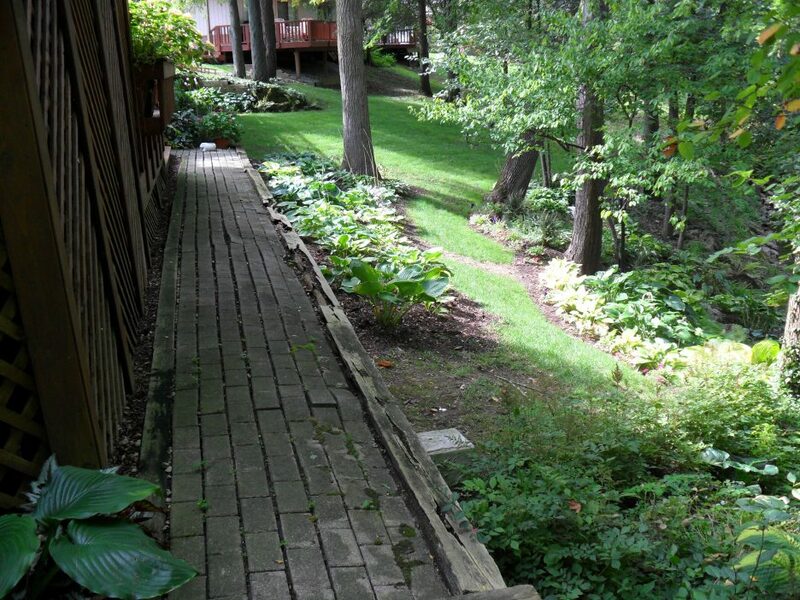 Before we started work on this sloping backyard, the homeowners had several deck levels with an uneven patio and rotting timber walls. 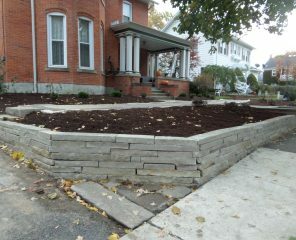 The walls were replaced with Anchor Highland wall stone. 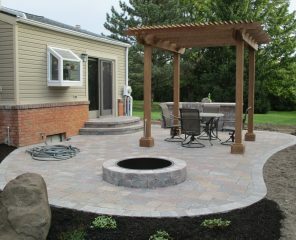 We then installed a new patio to replace the old and one level of decking. 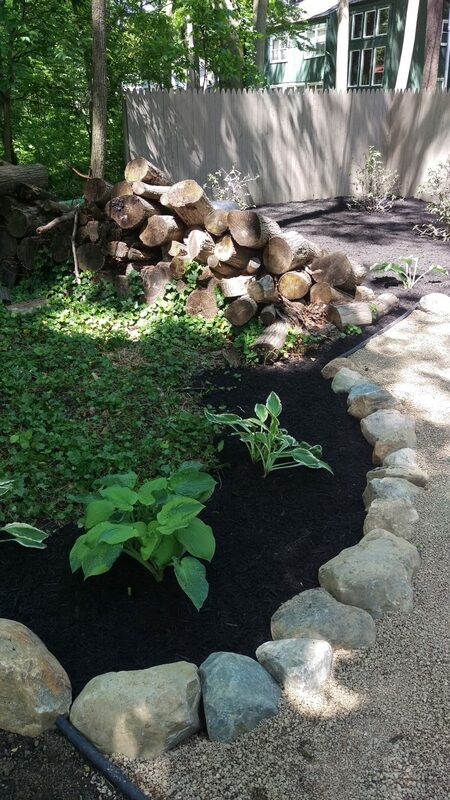 A new path was created through the owners’ beautiful hosta garden so guests can view the plants up close without sliding down the creek bank. 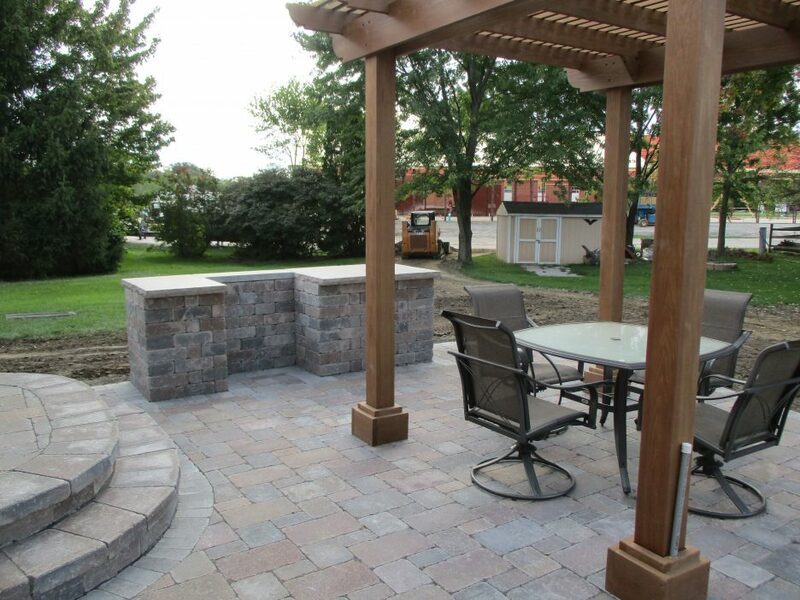 Now they can enjoy their hard work while relaxing on the new patio. 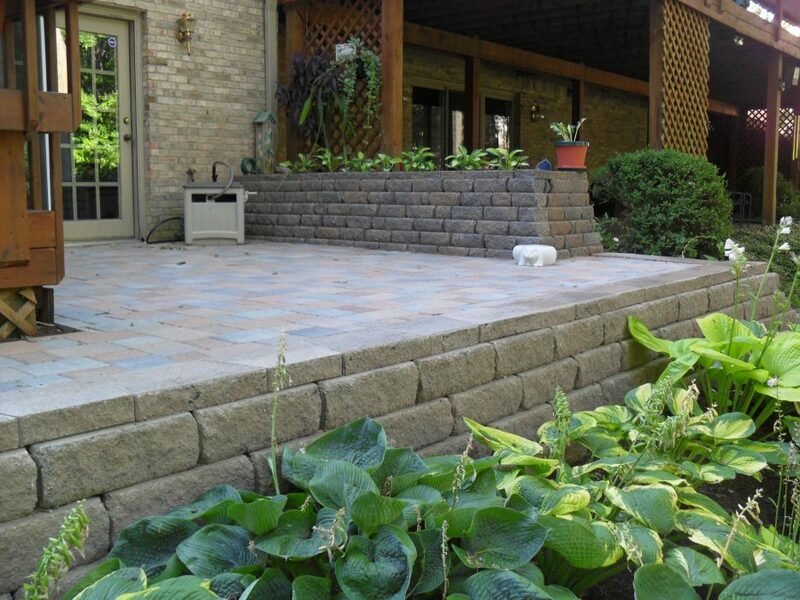 After having foundation repairs, the homeowners asked us to help put their landscape back together and to find a way to direct water away from the house. 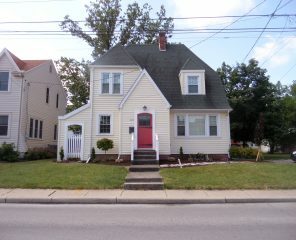 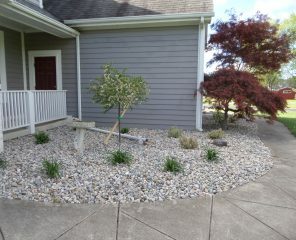 The new landscape adds white and purple (knowing the house will soon be gray) in the spring and summer. 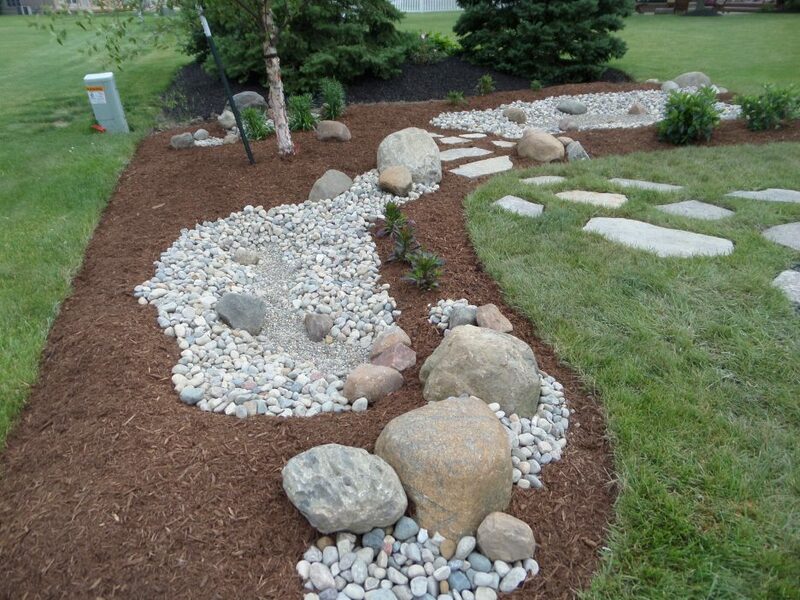 The river rock keeps the mulch in place while directing the water to the edge of the landscape beds. 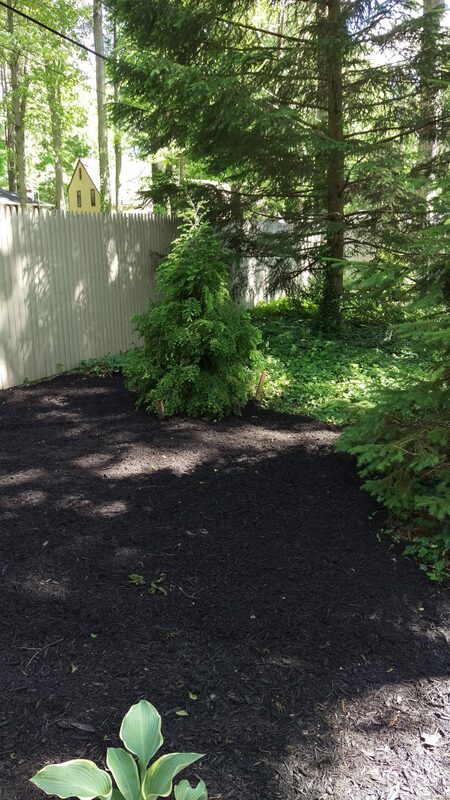 They wanted simple, easy, and a little privacy. 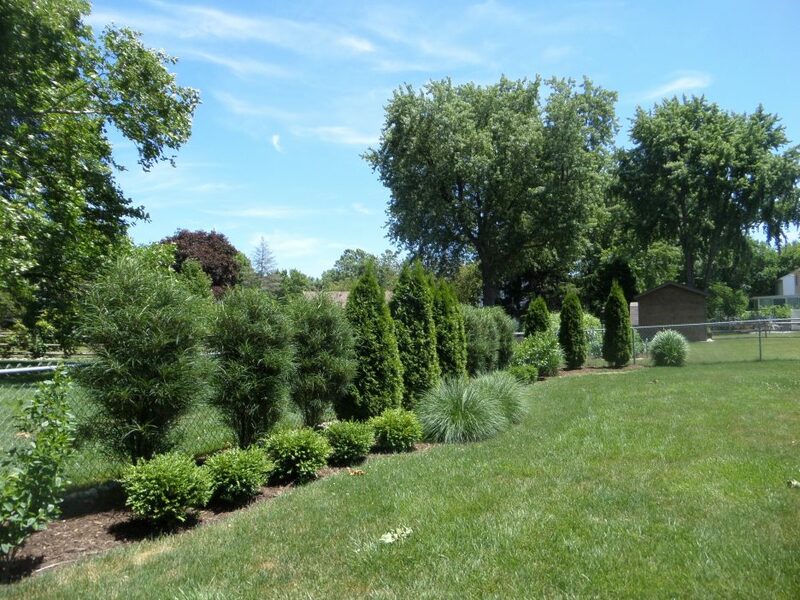 Arborvitaes and grasses provide cover in the winter months. Buckthorn, summersweet, and witch hazels add color and texture during the spring, summer, and fall. 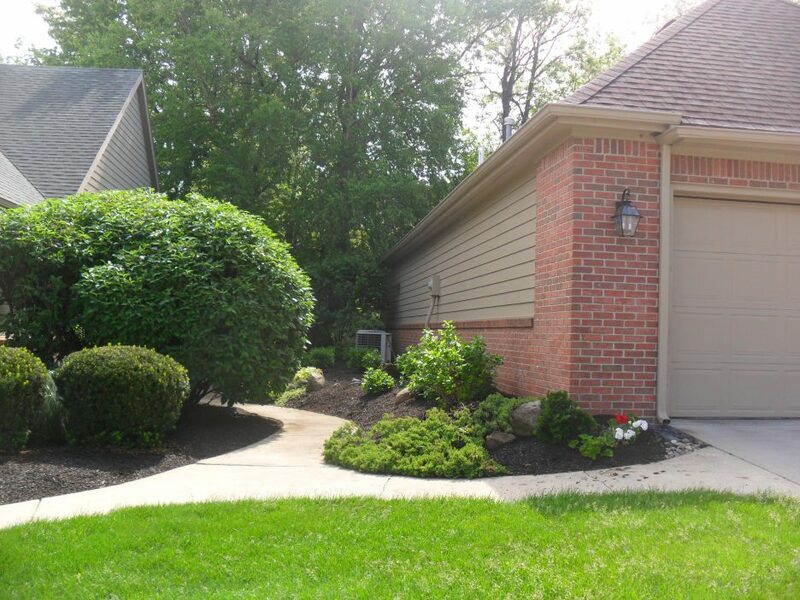 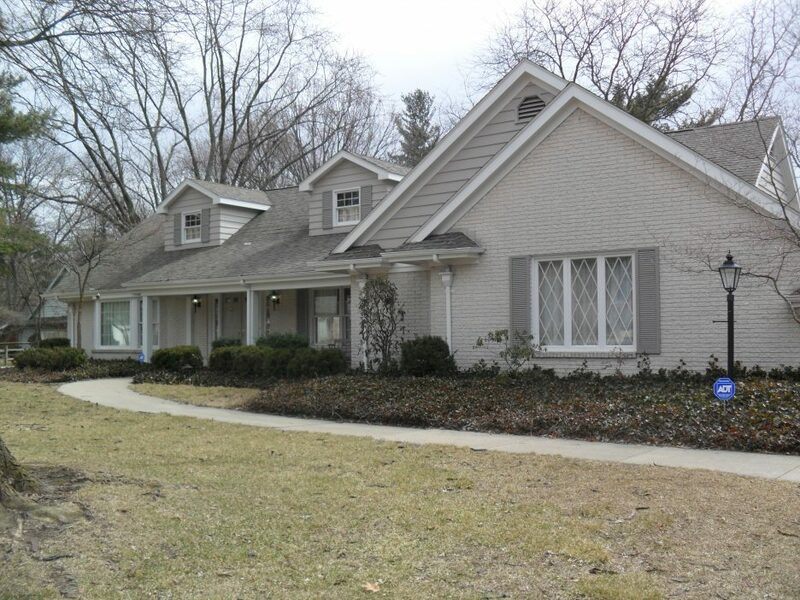 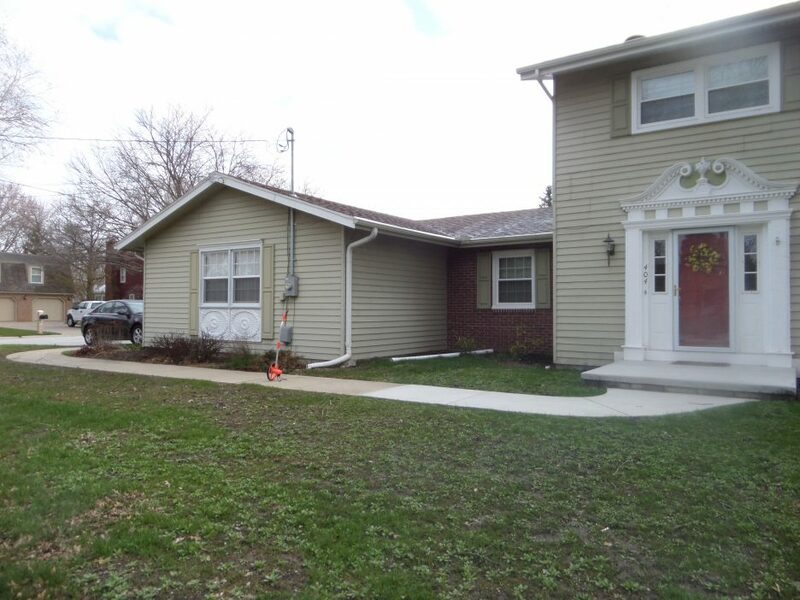 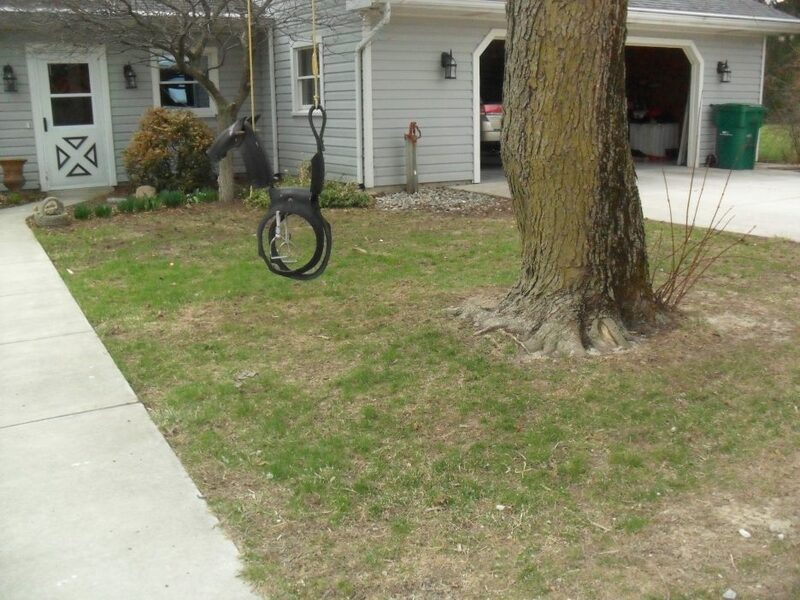 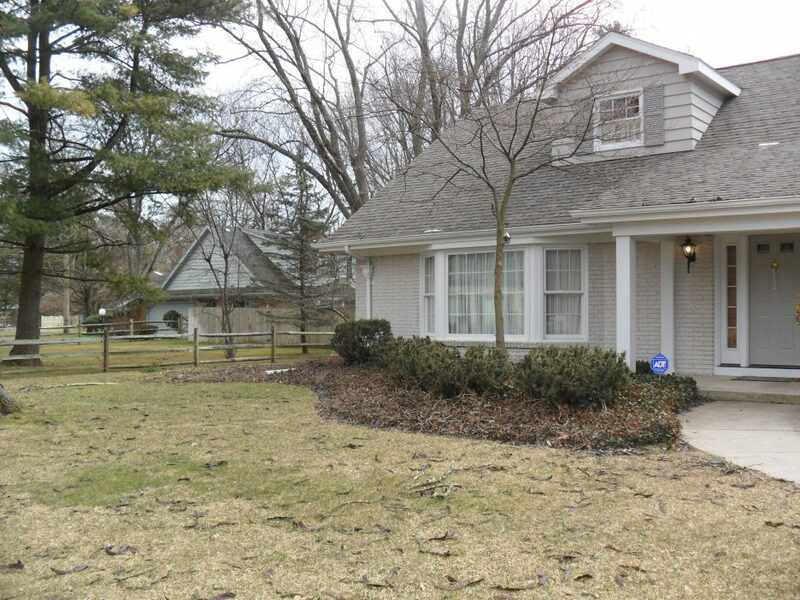 With almost no maintenance, the homeowners got what they were looking for. 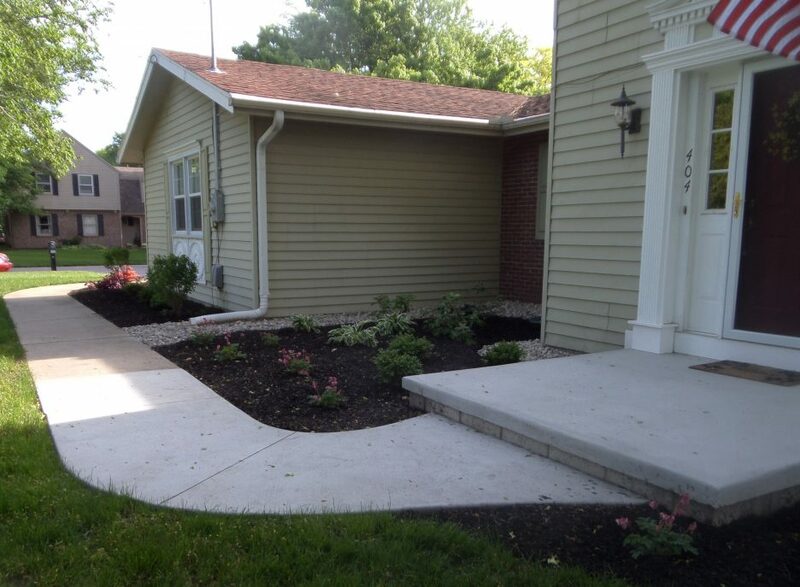 The first impression of this property was of a total redo. 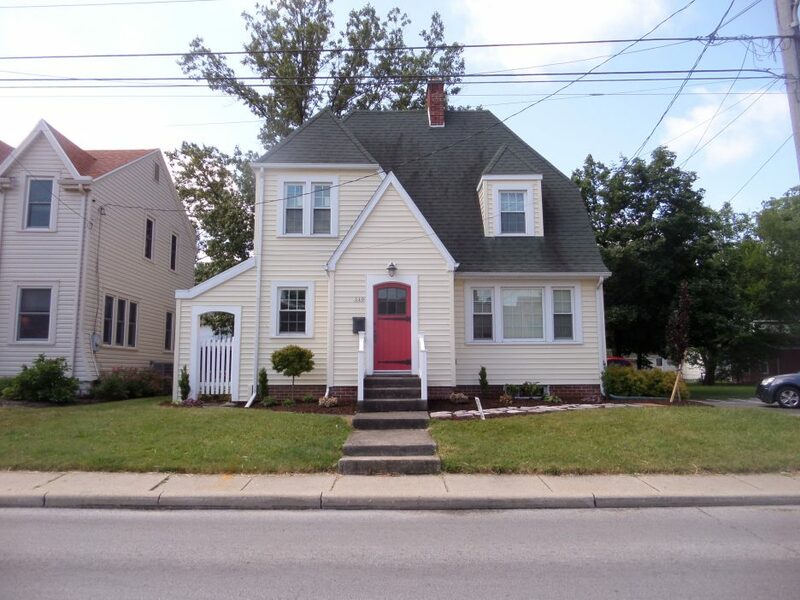 Luckily the new homeowners agreed. 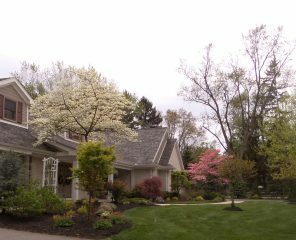 Only a few flowering trees in front of the house survived the demolition. 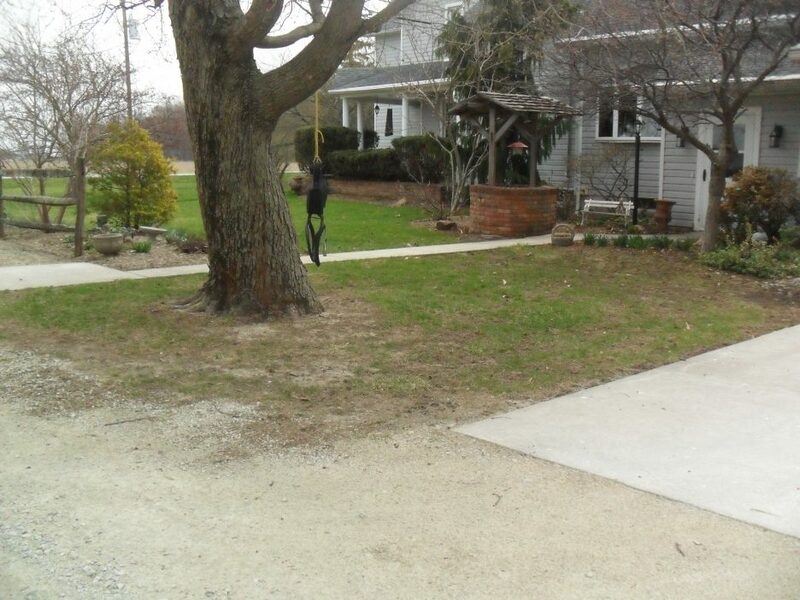 New shade trees were planted in the front along with the rest of the deer resistant landscape. 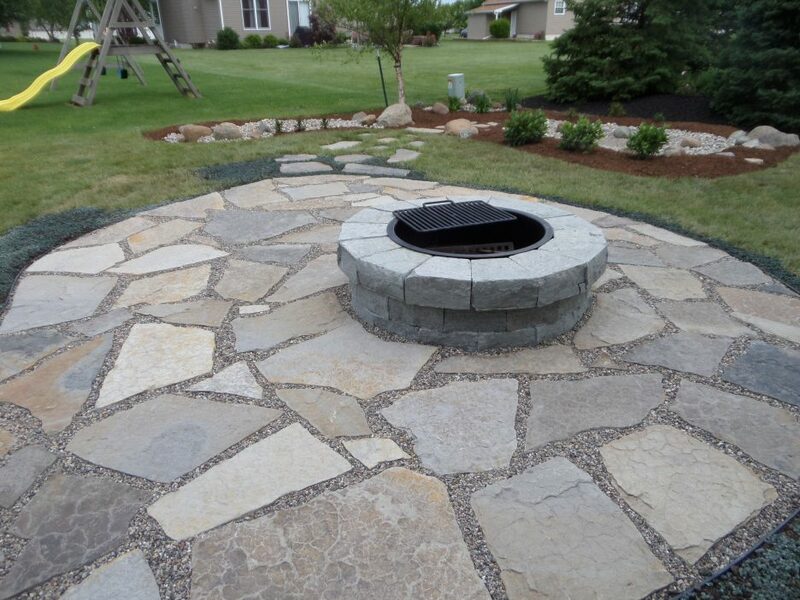 A Brussels Paver patio with grill island, fire pit, and wooden pergola was added to the backyard for extend living space. 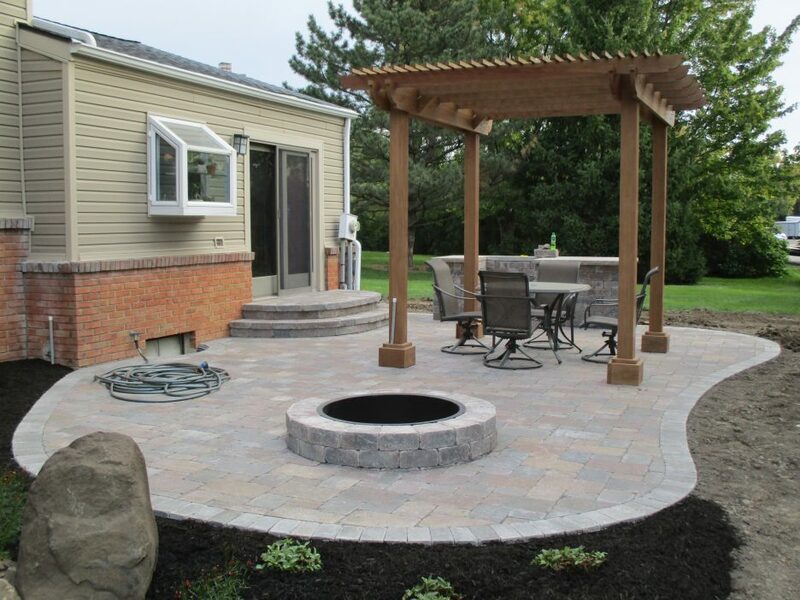 The 10' x 10' pergola is big enough for a table and four chairs, while still leaving room on the patio for seating around the fire pit. 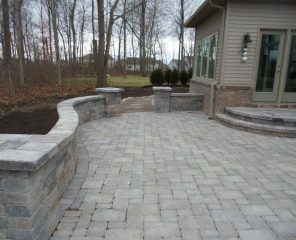 The clients knew their side door was the main entrance to their home, but they still wanted the front to be welcoming. 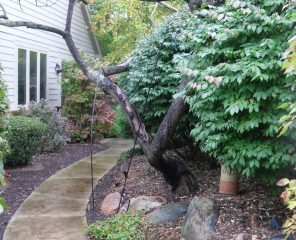 Plants worth saving were pruned and shaped and the others were removed. 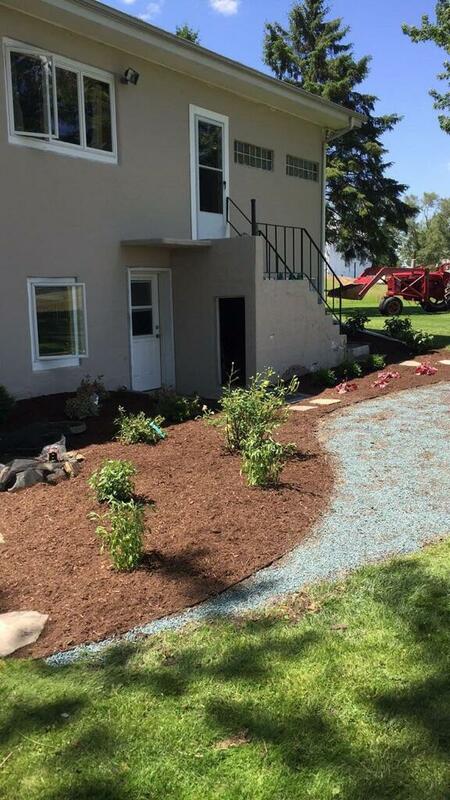 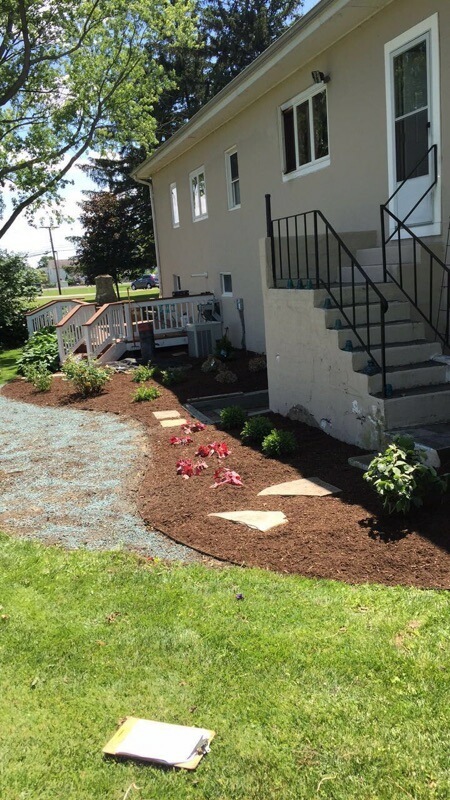 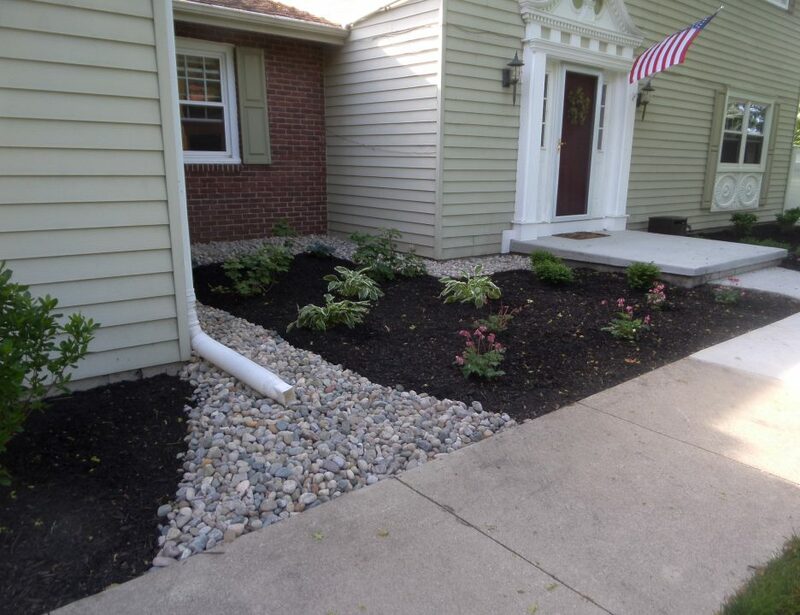 The new landscaping was topped off with river rock stone mulch. 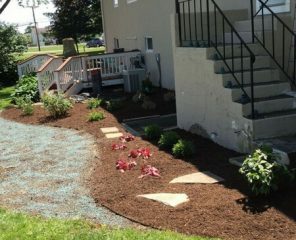 This beautiful historic home needed a little visual interest in the front yard to help set off the rest of its character. 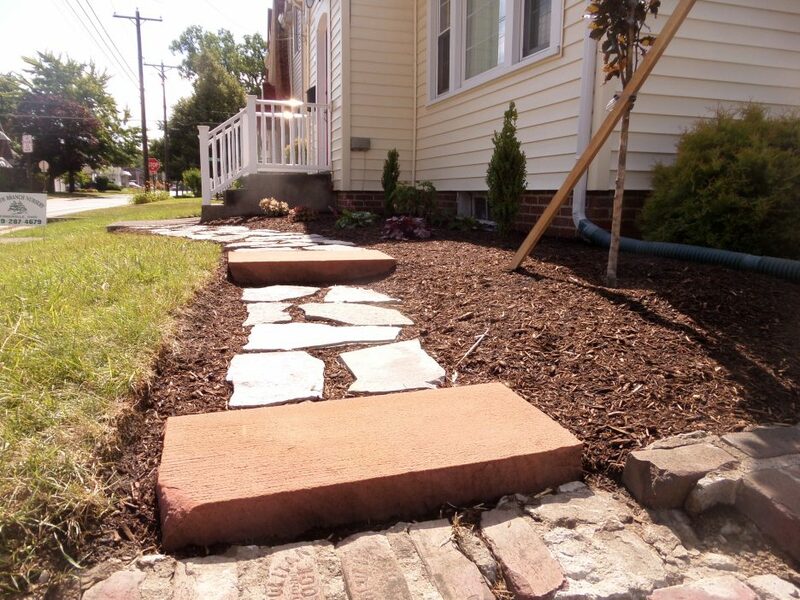 When the city poured new sidewalks the homeowner saved the old sandstone pieces. 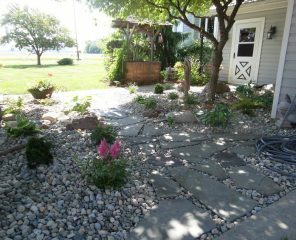 We reused them for a new sidewalk that leads from the driveway, across the front yard, and around to the backyard. 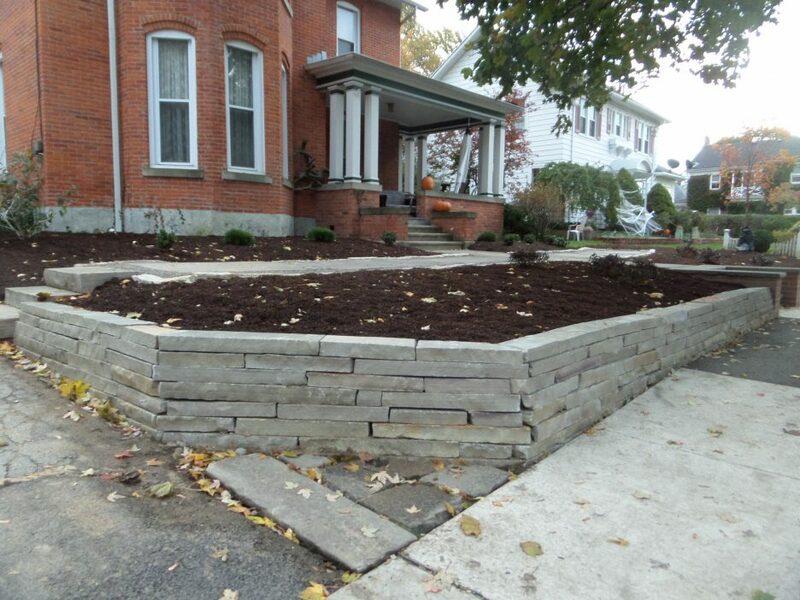 A sandstone wall was built to level the yard and add impact. 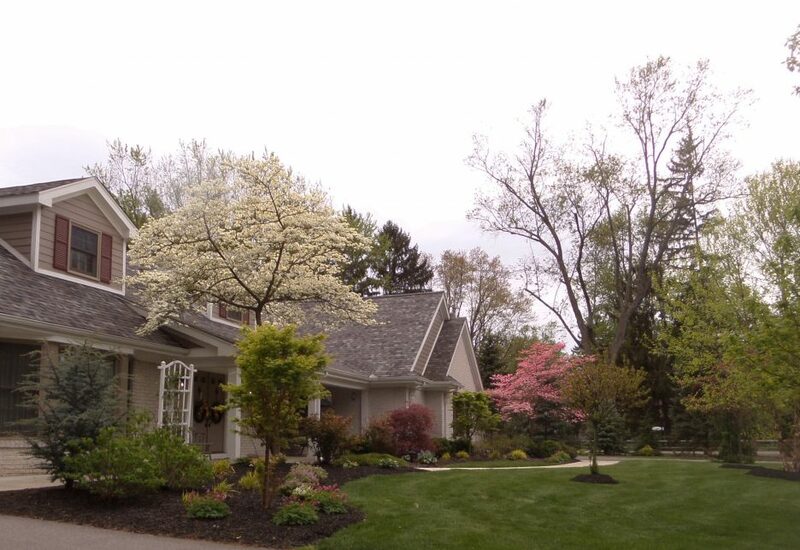 The new homeowners knew they had a great location with a beautiful home. 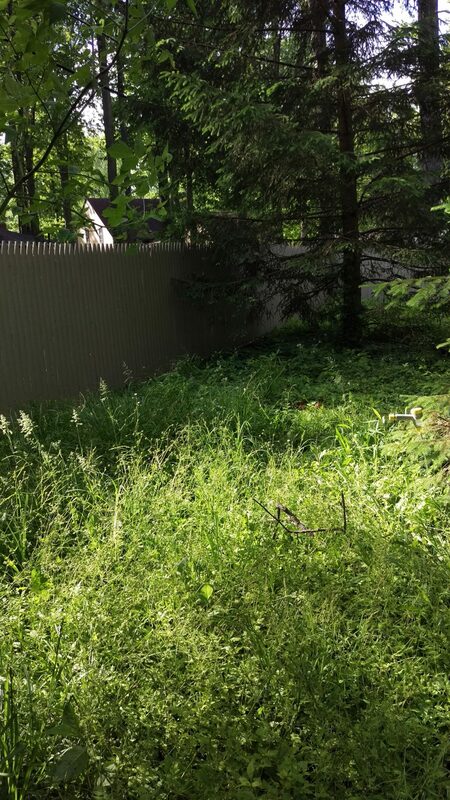 They also knew they had a few scary elements in the backyard that needed addressed right away. 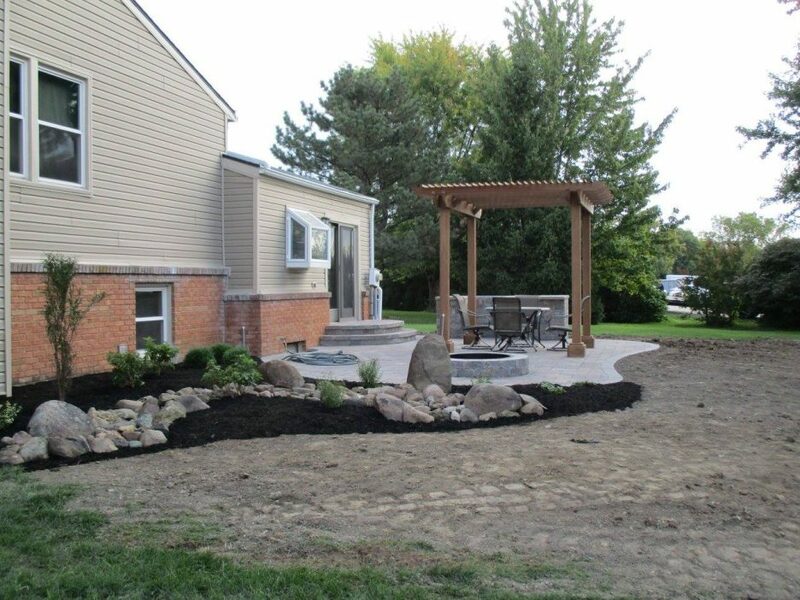 Our crews cleaned up the backyard and added a natural stone patio for a small seating space. 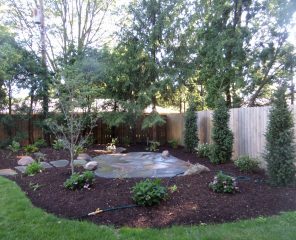 The new dogwood tree will grow to block the setting sun while the narrow evergreens along the fence will grow for added privacy. 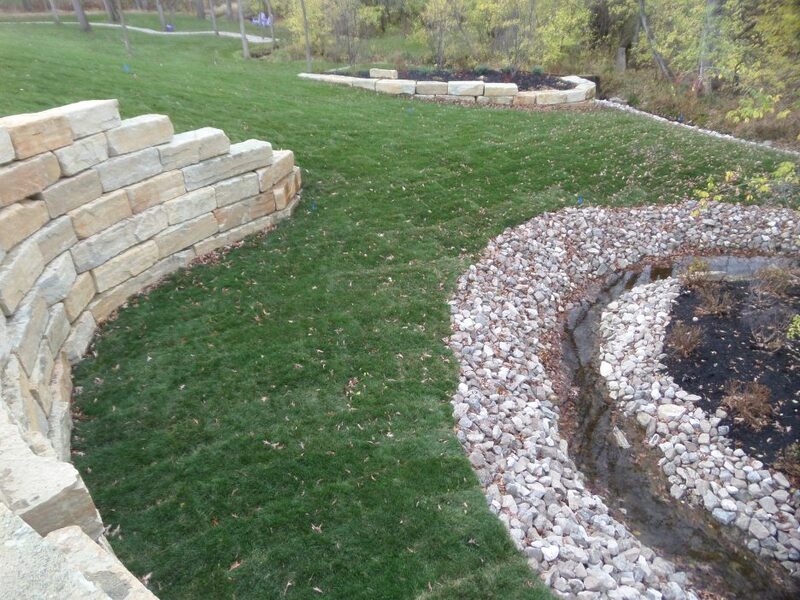 After building a pool, the homeowners had the sloping backyard cleared so they could see the creek below. 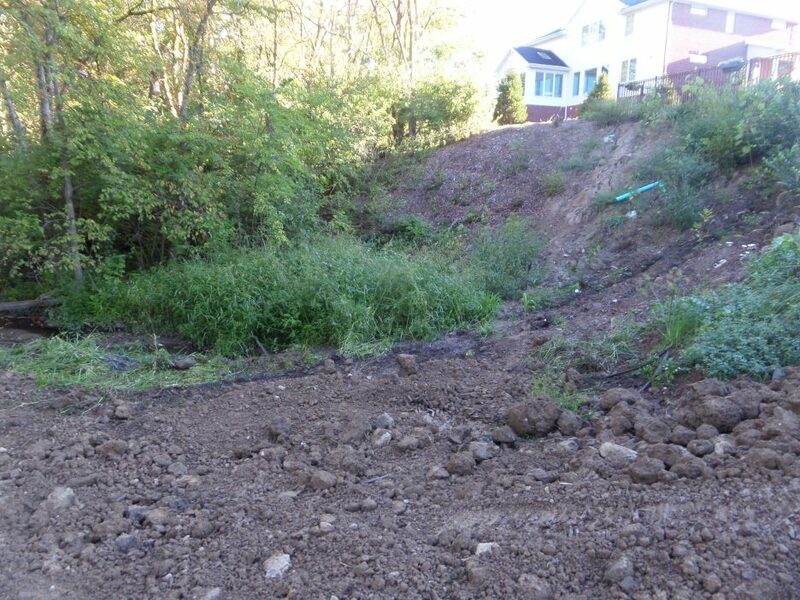 It revealed a much steeper slope than they expected. 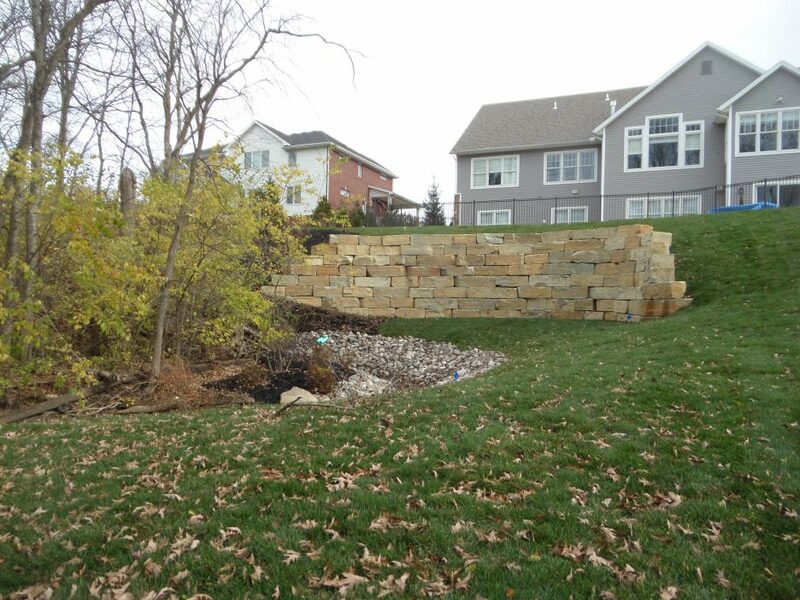 To protect their pool and to create useable space in the backyard, we built a large natural stone retaining wall. 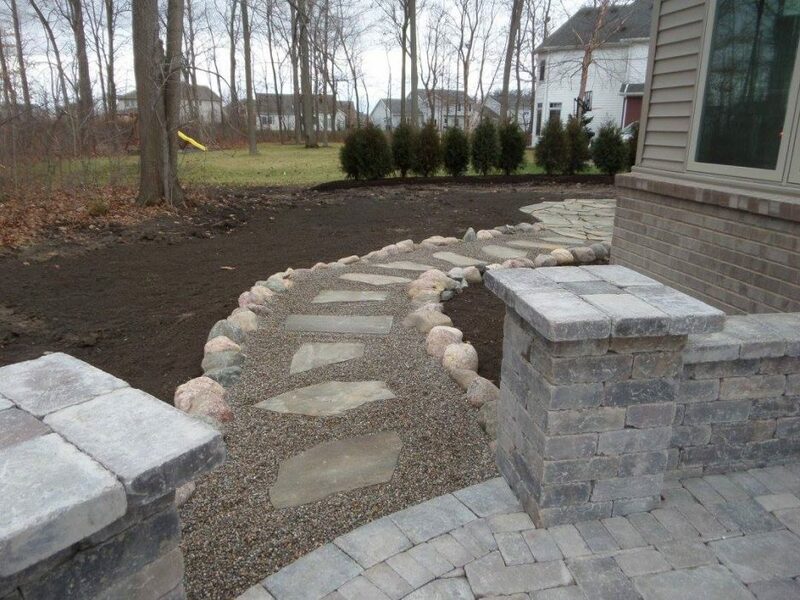 A second, shorter wall ties the landscape bed together. 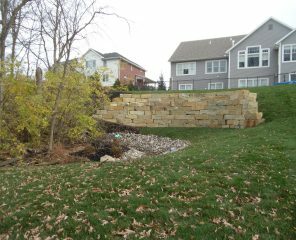 Rip rap stone was added along the creek to preserve its banks and new sod was installed to finish everything off. 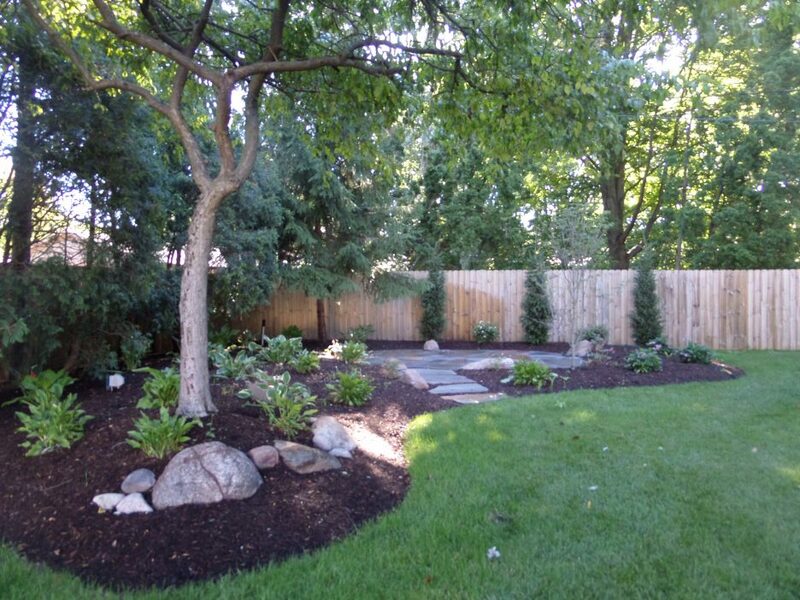 A backyard with no grass can be a daunting task. 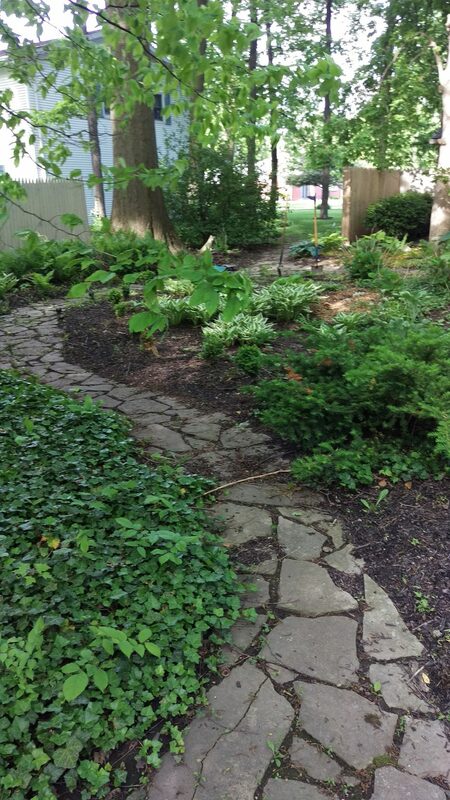 The groundcover originally planted had grown out of control and weeds were taking over. 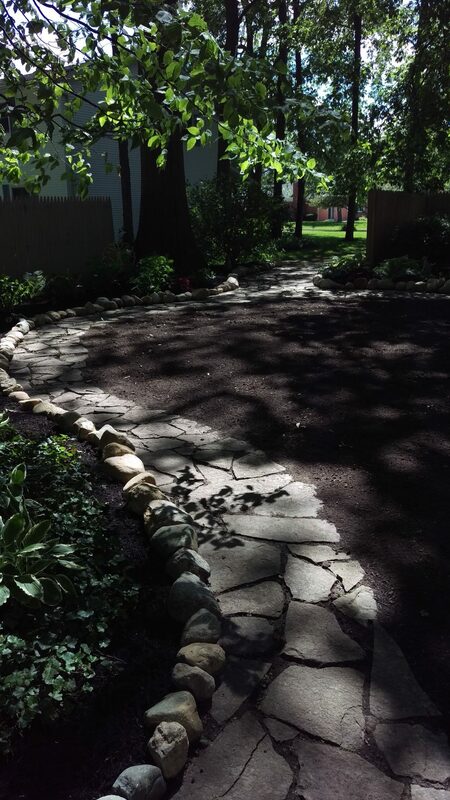 Our crews spent several weeks uncovering the old flagstone paths, clearing spaces for new landscaping, and adding gravel paths for more function. 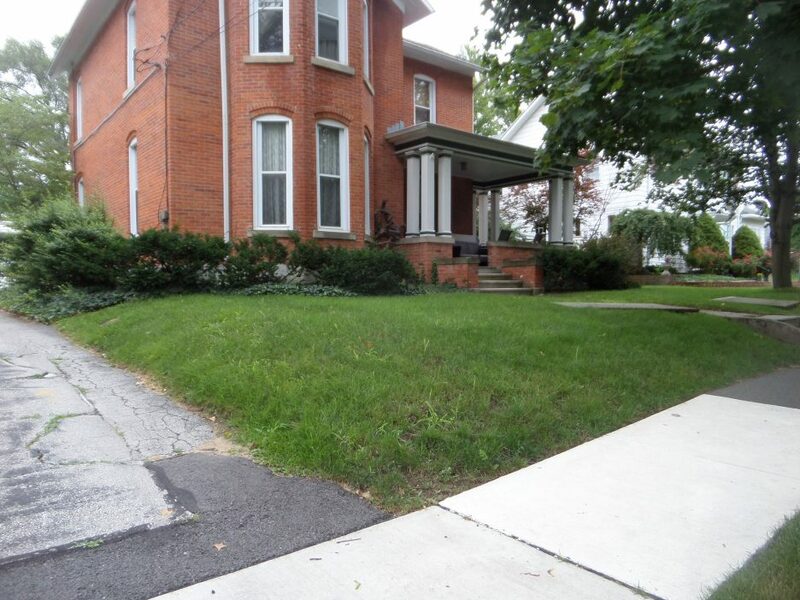 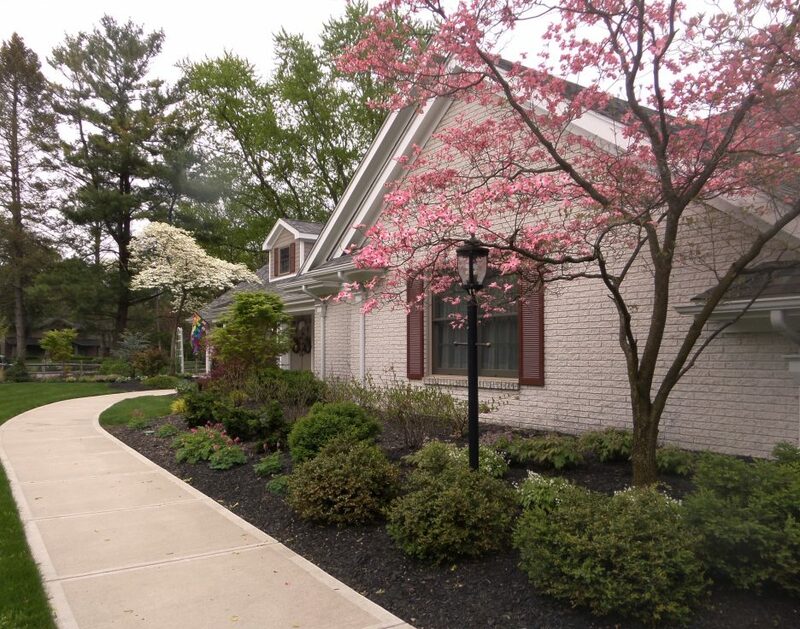 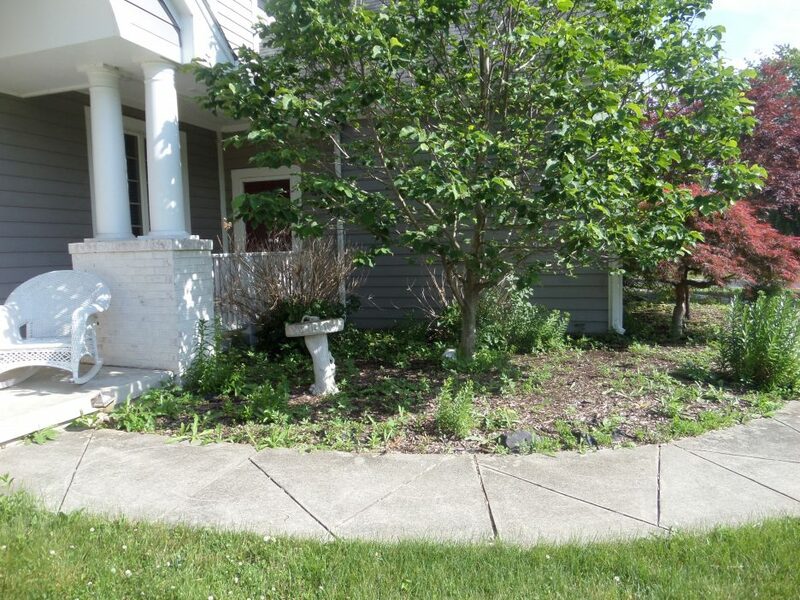 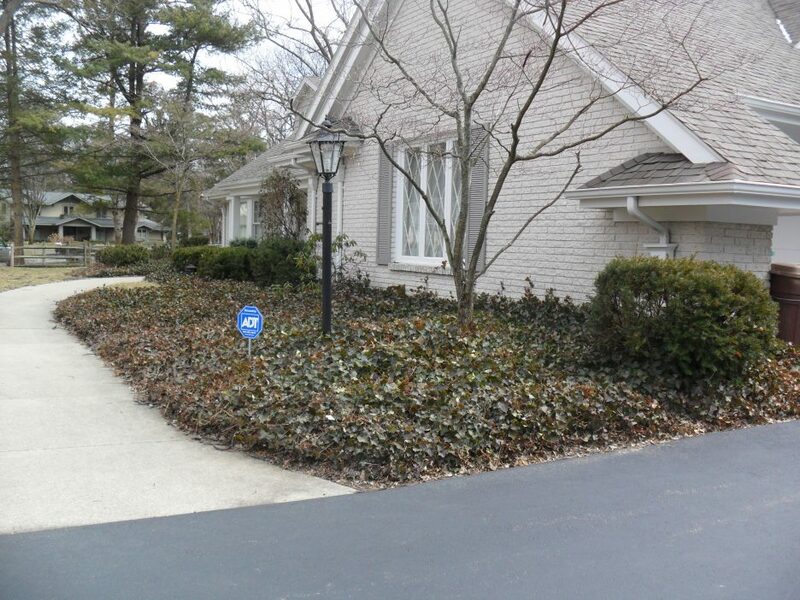 The space between the sidewalk and driveway at this home was always an unappealing trouble spot. 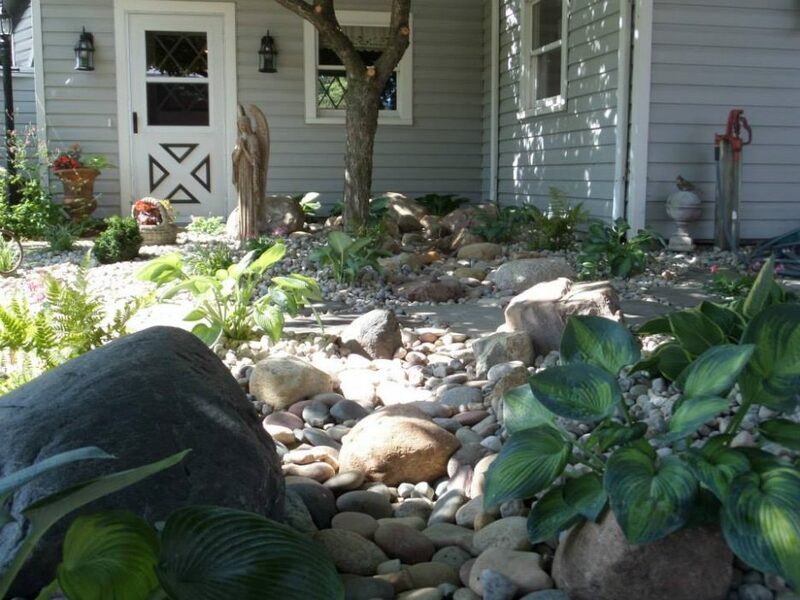 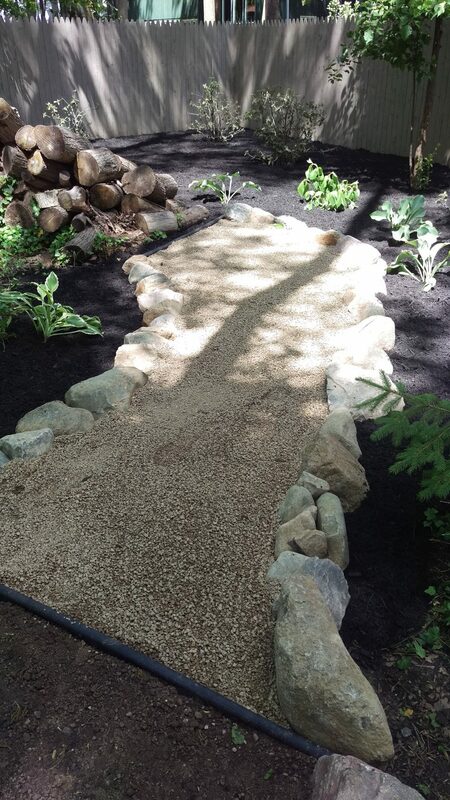 After removing the thinning lawn, a dry creek bed was installed using a mix of river rock, large river skips, and flagstone. 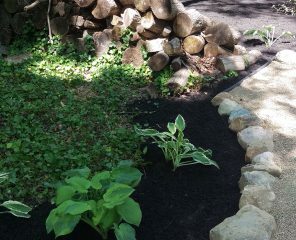 Shade plants were added for color. 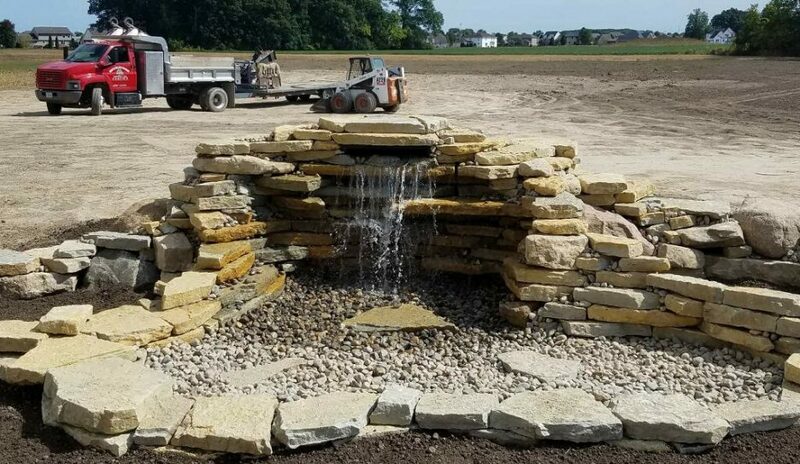 First priority at this new construction project was to install the water feature. 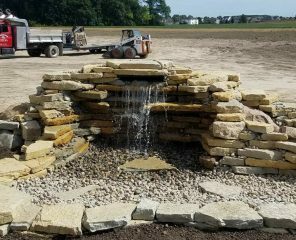 The homeowners were able to enjoy the sound of falling water from inside their new home while the landscape and lawn were installed later in the year. 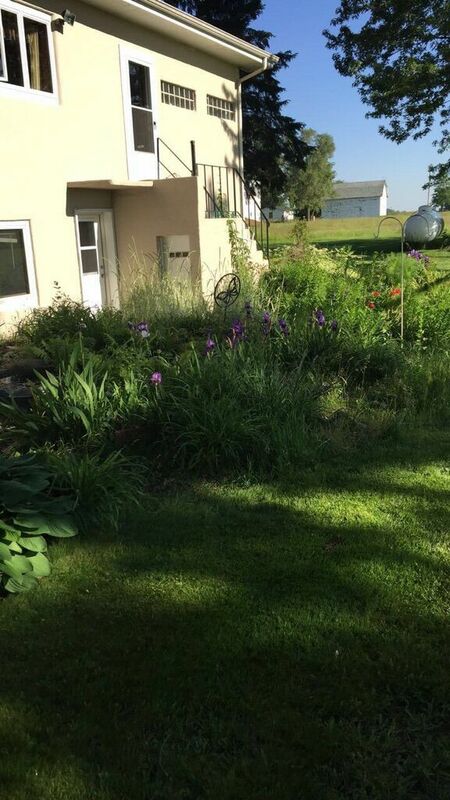 Some perennials can be bullies. 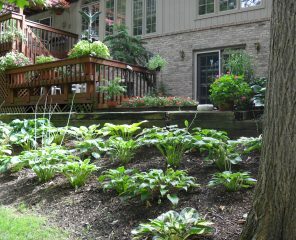 They take over and make it difficult to enjoy your landscape without becoming overwhelmed with it. 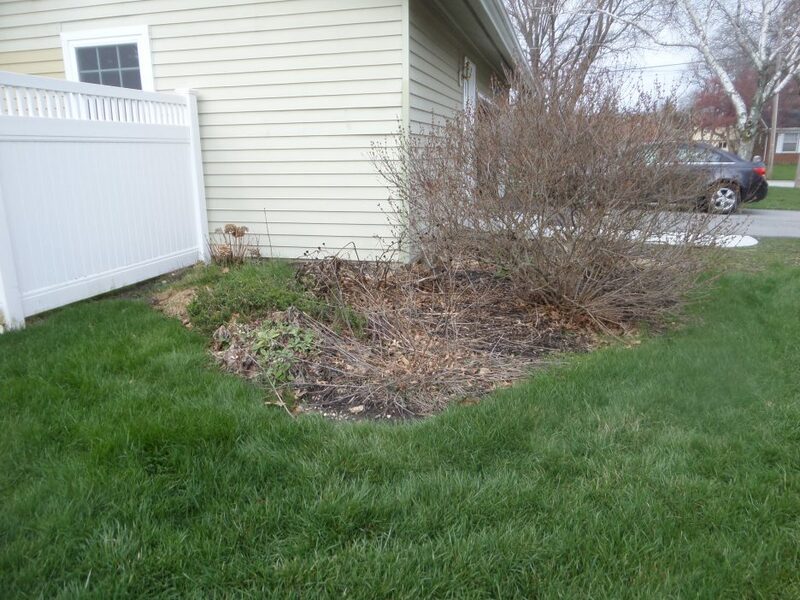 Since thistle and other weeds had invaded the bed, everything was removed so the homeowners would have a fresh start. 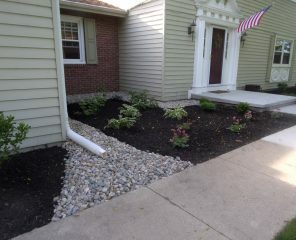 The new landscape has a few shrubs mixed in for additional color and texture. 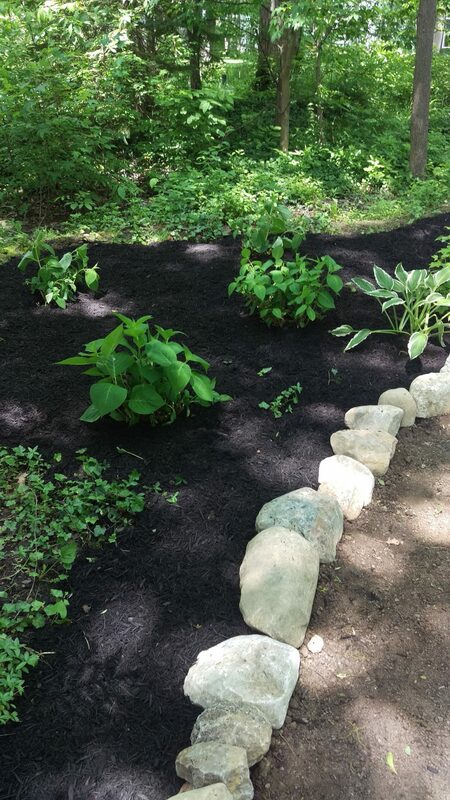 The bed was also reduced to cut down on maintenance. 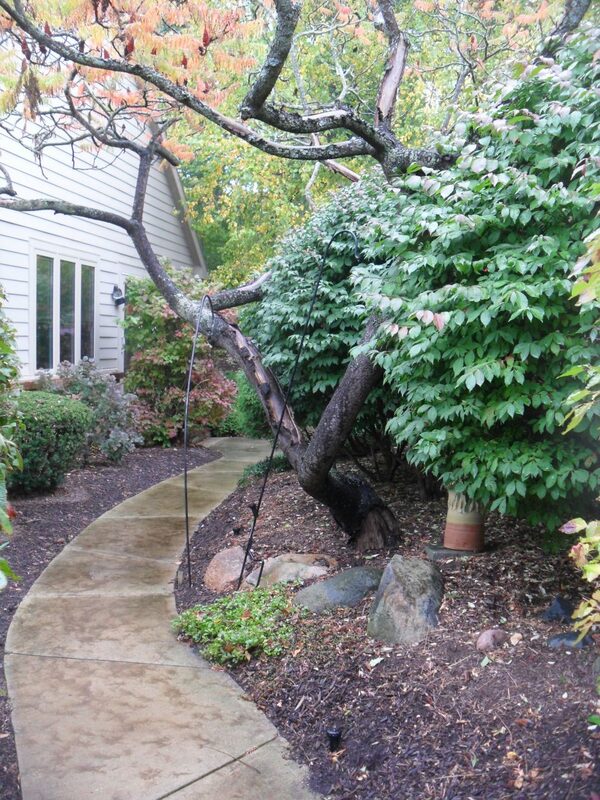 The existing landscape was updated all the way around this home. 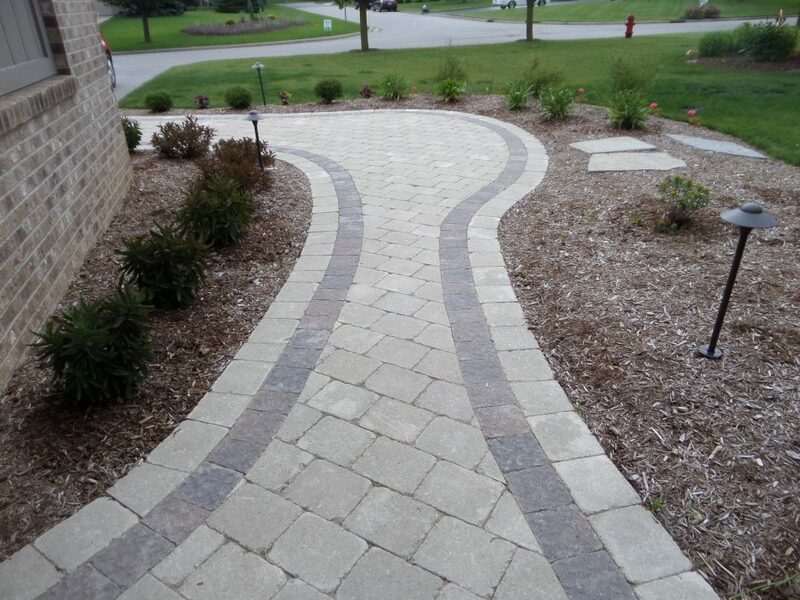 The front sidewalk was replaced with a wider, curved paver sidewalk. 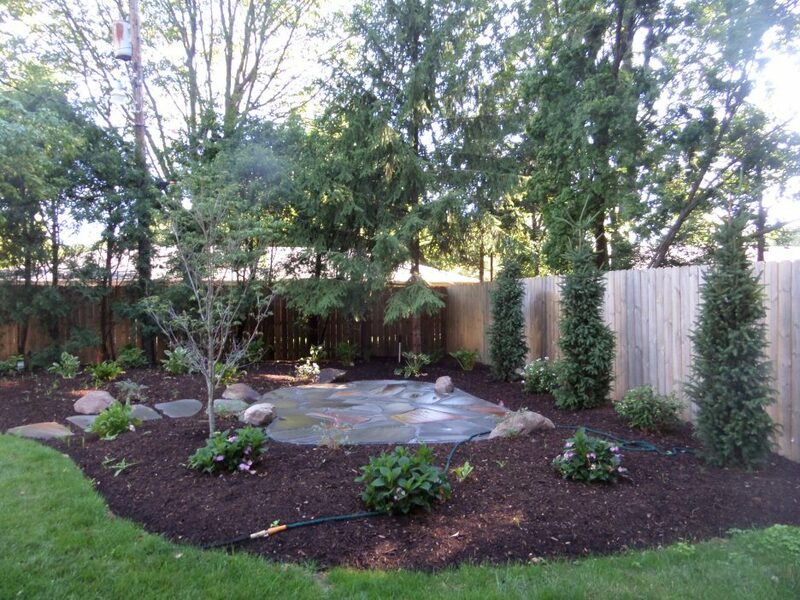 The landscape lighting in front and back were both updated. 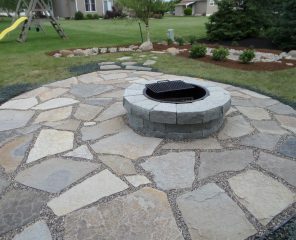 The backyard also received an upgrade with a new natural stone patio and fire pit. 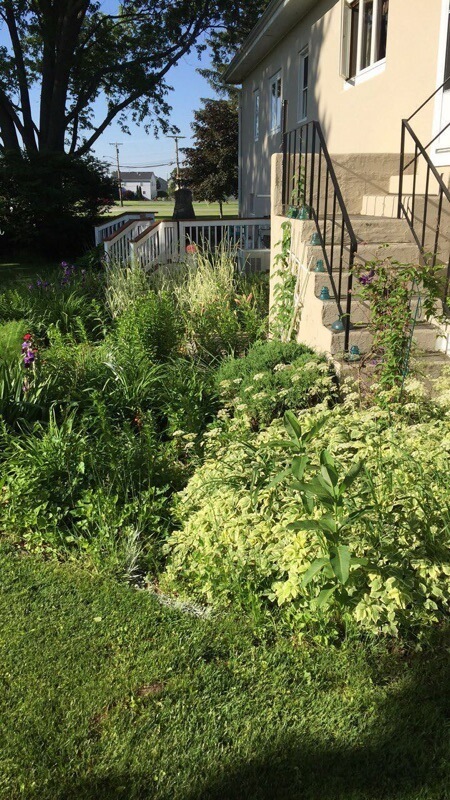 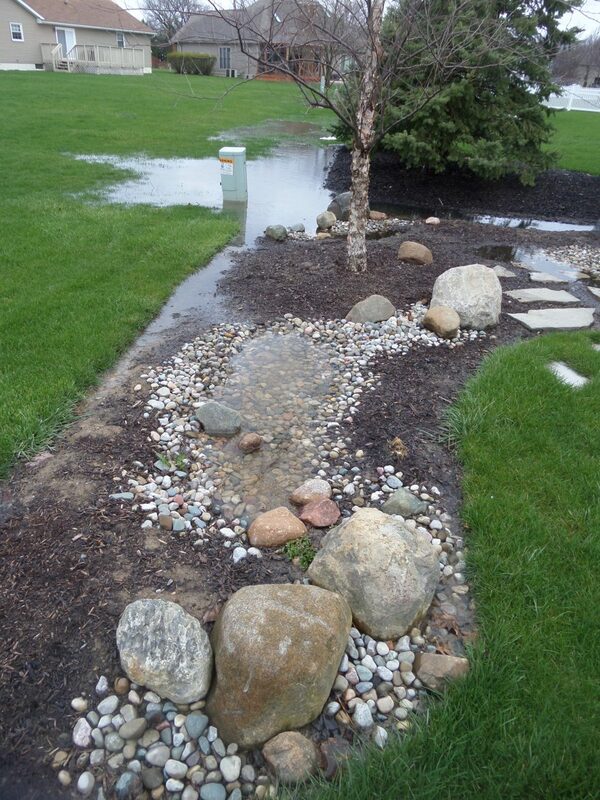 The back corner of the property regularly flooded so a rain garden was added to collect and absorb the water.